Washington senior Evan Upthegrove (3) looks to shed a defender with the help of a screen by senior Richie Burns during a Frontier Athletic Conference game at Chillicothe High School Friday, Jan. 18, 2019. Pictured for Chillicothe, at right, is Brandon Noel. CHILLICOTHE — In the first round of Frontier Athletic Conference play, back on Dec. 11, the defending champion Chillicothe Cavaliers visited Washington High School. In that game, Washington emerged with a 47-41 victory. On Friday night, the two teams played the return engagement at Chillicothe High School. Both teams came into the game tied atop the FAC standings at 5-1. Chillicothe came away with a resounding 56-26 victory. The Cavaliers got further good news when they learned that the Hillsboro Indians had defeated Jackson, 54-45. The Blue Lions are now 5-2 in the conference. Jackson is now 4-3 and they are tied for third place with McClain after the Tigers defeated Miami Trace last night, 67-34. Hillsboro is 2-5 in the conference and the Panthers are 0-7. In last night’s game, Chillicothe shot the ball very well and Washington struggled from the field. The Cavs connected on 25 of 41 field goal attempts for 61 percent. Washington made 10 of 38 shots for 26 percent. 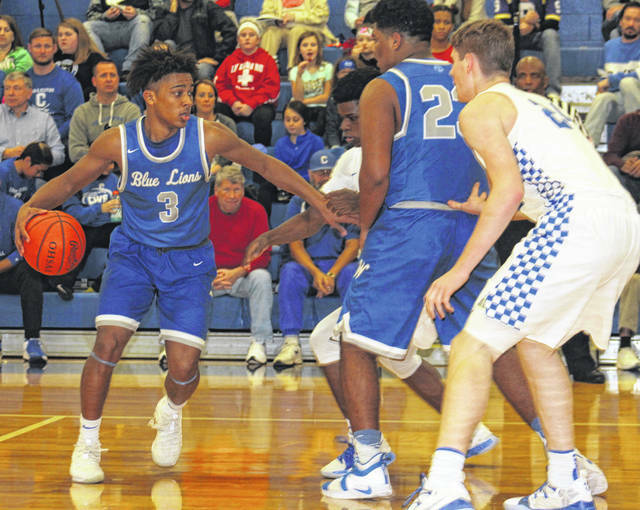 Chillicothe, who has been beating teams from the perimeter in some recent games, was led by 6-7 junior Brandon Noel with 17 points. In fact, the Cavs had just three three-point field goals on the night, all from senior Chris Postage who finished the game with nine points. Junior Jayvon Maughmer had nine and junior Christian Benson scored seven points. Washington was led by senior Omar Porter with nine points. A trio of seniors, Blaise Tayese, Evan Upthegrove and Richie Burns, each scored four points for the Blue Lions. The teams came out and the nerves were showing early. The game was tied at the end of the first quarter, 6-6. At the half, Chillicothe held a 20-12 lead. The Blue Lions had their best scoring period in the third, hitting for 12 points to 17 for the Cavs for a 37-24 margin. Washington just could not buy a basket in the fourth quarter, going 0 of 9 from the field while the Cavs hit 9 of 11 field goal attempts to pull away for the 56-26 victory. “I thought defensively we were really good all night,” Chillicothe head coach Eric Huffer said. “I thought we were good enough defensively to win the first match-up. But, offensively we weren’t able to do a whole lot. “They are one of the best half-court defensive teams we’ll play,” Huffer said. “They pressure the ball real well and switch screens. I thought we got used to the pressure. “We’re a dribble-drive offense,” Washington head coach Connor Scott said. “When you don’t make shots, Chillicothe can just sit in the paint. Then we can’t drive as well, because they’re just sagging off. Washington was 5 of 13 from the foul line. Washington (9-4 overall) is back at home Tuesday to host Lynchburg-Clay at 6 p.m.
Chillicothe hosts McClain Friday, Jan. 25. WASHINGTON — Eli Lynch 0-0-0; Evan Upthegrove 2-0-4; Miguel O’Flaherty 1-0-2; Blaise Tayese 1-2-4; Garitt Leisure 0 (1)-0-3; Karson Runk 0-0-0; Omar Porter 3-3-9; Brice Cartwright 0-0-0; Drew Moats 0-0-0; Richie Burns 2-0-4; Mitchell Lotz 0-0-0. TOTALS — 9 (1)-5-26. Free throw shooting: 5 of 13 for 38 percent. Three-point field goals: Leisure. Field goal shooting 10 of 38 for 26 percent. Turnovers: 11. CHILLICOTHE — Josh Howard 0-0-0; Tre Beard 1-0-2; Vincent Roper 2-0-4; Chris Postage 0 (3)-0-9; J’Quan Harris 2-0-4; Brandon Noel 8-1-17; Kaiden Riffe 0-0-0; Jayvon Maughmer 4-1-9; Christian Benson 3-1-7; Eli Taylor 2-0-4; Lucas Crawford 0-0-0. TOTALS — 22 (3)-3-56. Free throw shooting: 3 of 6 for 50 percent. Three-point field goals: Postage, 3. Field goal shooting: 25 of 41 for 61 percent. Turnovers: 12.